That’s the language that animated the House Trump relationship with Kim Jong Un and the hermit kingdom of North Korea as far back as January, at President* Donald Trump’s first State of the Union address, and as recently as last August. 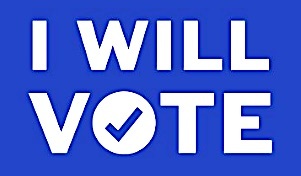 Now? Meh. Not so much. Why? Because it’s all different now. The summit between Trump and Kim, once set for June 12 in Singapore, then canceled, is back on again. But what’s been positioned as a meeting that Pyongyang desperately wants will be anything but. The denuclearization issue that was a tripwire for the United States is now, amazingly, not such a big damn deal after all. Such is an object lesson in the risks of improvisational diplomacy at the hands of Donald Trump. In a June 1 grip-&-grin from the Oval Office, Kim Yong Chol, spy chief and the warden king of a North Korean gulag thought to hold as many as 200,000 North Koreans, was welcomed at the White House, huddling with Trump in a long meeting in the Oval. 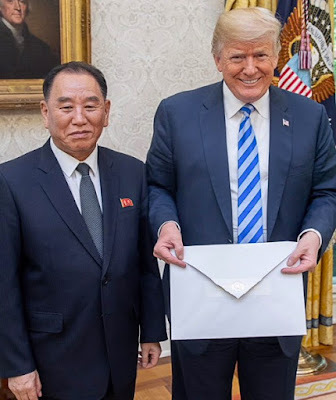 He presented Trump with a letter from Kim Jong Un — a message inside a comically oversize envelope, the kind of thing they use to hold the winning check in the Publishers Clearing House ads on TV. It was Kim Jong Un’s opening gambit, an overture that Trump will be hard pressed to regard in antagonistic terms. Trump made a mid-course correction on Friday in terms of his new expectations for the June 12 summit — he’s calling it “a getting-to-know-you meeting, plus,” whatever the hell that means — but it’s a shame he didn’t do that in March, when the summit idea first surfaced. If he had, he’d have more credibility on the issue than he does now. AS IT STANDS, Trump’s doing more or less exactly what he’s accused his Oval Office predecessors of doing: slow-walking the process of diplomacy with Pyongyang. It’s what a CNN analyst on June 1 called “a carrot-and-stick approach,” with the current negotiation being the carrot — negotiation that will certainly include Trump soft-pedaling on sensitive issues like human rights, a guaranteed nonstarter with Pyongyang. Which makes sense since the rhetorical sticks of the past — Trump’s “fire and fury” gibberish, his cheap “Rocket Man” taunt at the United Nations — didn’t get anywhere. 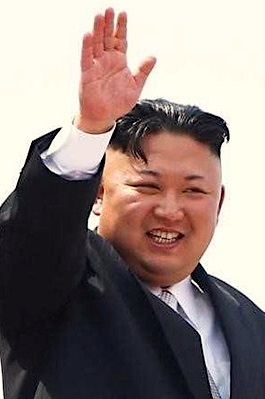 For his trouble, Kim Jong Un acquires instant credibility. And leverage: The issue of denuclearizing the Korean peninsula — one of the main reasons for the summit, and something Trump and his minions have tried to hammer home for months — may not even be on the table in Singapore. All this lurching from lane to lane points to the way Trump apparently intends to do business. 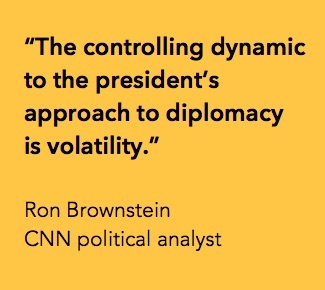 On CNN, political analyst Ron Brownstein got it right: “The controlling dynamic to the president’s approach to diplomacy is volatility.” And that’s not just true for diplomacy, it’s been just as true for Trump’s approach to domestic politics, campaign politics, and congressional politics. So when one willfully volatile leader faces off with another, it’s foolish to expect a smooth glide path at the negotiating table. 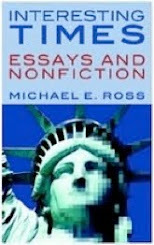 The two Koreas have been in conflict for more than 60 years. Anyone who thinks the differences between them will be magically erased in one or two shiny, happy Kum Ba Yah moments needs an intervention. When he walked away from the summit before, Trump was playing to his base in crafting a rationale for that meeting being canceled, waving the flag and rattling sabers in equal measure. But months of bluster and bellicose tweets scarcely concealed an administration on the back foot when it comes to dealing with Pyongyang. THE TWO KIMS may be wondering if Trump can be taken seriously. The two Kims may also wonder how seriously Trump takes himself. Jon B. Wolfsthal, a former senior White House official and scholar at the Carnegie Institute, grasped the situation in a May 24 piece for Politico after the summit was first scuttled: “Don’t be fooled. Trump wants the meeting as badly as ever, and will jump at the chance to reschedule if and when the time suits him.